It seems like the people who create children’s songs are doing something right. 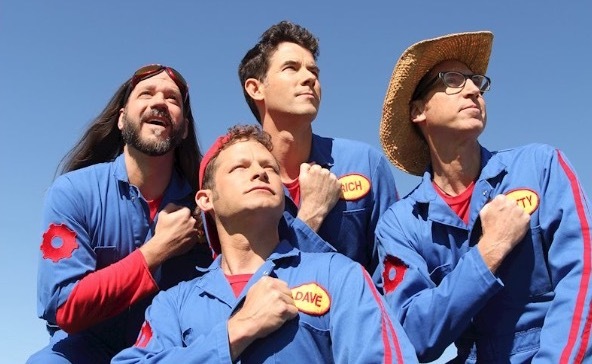 Imagination Movers has a new album called 10-4 and it appeals to all ages. It’s no coincidence that this children’s music is getting a lot of attention. The album 10-4 is comprised of 13 fun songs that cover topics of great importance to little ones and their parents. Imagination Movers are Disney Channel stars who have won Emmy award accolades for their work. There’s a positive message of teamwork and problem-solving in their music, skills that we all need to learn. Scott Durbin, Rich Collins, Dave Poche and Scott “Smitty” Smith started out as friends and ended up putting together a kids TV show. It was the winning music that got the attention of producers and promoters who not only used the music in the TV show, but decided to put the lads on the road. The live show is really something to see as it is controlled calamity complete with confetti and crazy antics. The Imagination Movers have been touring 10 years and they’re often referred to as the Blue Man Group for the family set. There’s everything anyone could want to hear on this record. The songs go from slow and melodic to wild rock and topics cover lyrical advice that kids are open to hearing.